Sawyer Valentini (Claire Foy) is a banker who has just moved from Massachusetts to Pennsylvania. She used to volunteer as a hospice aid worker, selflessly giving her time and her love to those who needed it. But Claire had to leave that life behind. The victim of a driven, unrelenting stalker named David Strine, the young woman didn’t even tell her mother Angela (Amy Irving) why she so suddenly fled her hometown of Boston, her fear of him so all-encompassing she could see no other recourse than to cut all ties and vanish out of state to get away from him. Still psychologically reeling from the rabbit hole of fear that David’s stalking provoked, Sawyer makes the decision to go speak with a counselor about her lingering uncertainties. Feeling pretty good after speaking with one of Highland Creek Behavioral Center’s therapist, she fills out exit paperwork thinking she’s setting up a second appointment sometime in the coming week. What she’s really done is self-commit herself into the facility for 24-hours of observation, Claire unsurprisingly not at all happy by what she views as unacceptable deception on the part of the hospital. But because she throws an angry fit, the psychologists at the facility extend her stay to seven full days. Worse, there’s a nurse at the facility named George Shaw (Joshua Leonard) who looks exactly like her stalker, David Strine, and thanks to his presence Claire understandably begins to wonder if her grasp on reality is as strong as she adamantly proclaims it to be. 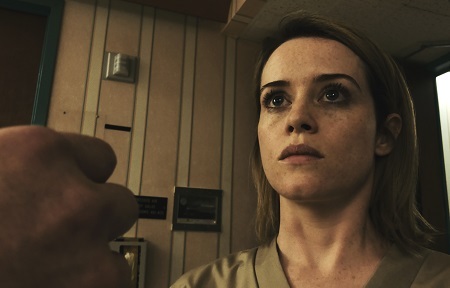 Steven Soderbergh’s Unsane is a down and dirty psychological horror-thriller that’s as grungy and as unhinged as it is focused and intelligent. Working from a tight, uncompromisingly bleak script by Jonathan Bernstein (The Spy Next Door) and James Greer (Just My Luck), the director follows up last summer’s Logan Lucky with another genre-bending, self-financed effort that has more going on just underneath the surface than initially meets the eye. Like that one, this film is rather sensational. Also like that one, convincing people to give it a shot might be more difficult than it otherwise should be. In this case, that audiences might not be initially open to giving Unsane a look isn’t altogether surprising. Not only is it a dingy psychological thriller revolving around themes of insanity and sexual abuse, even though Foy has seen her fame increase since her breakout turn in Netflix’s “The Crown” it’s safe to say this film still lacks the star power of Channing Tatum, Adam Driver, Daniel Craig, Seth MacFarlane, Hilary Swank, Riley Keough and Katie Holmes that Logan Lucky brought to the table. Inspired by Sean Baker’s Tangerine, Soderbergh also shot this motion picture on an iPhone and purposely gave it a squalid, lo-fi look in order to help magnify Sawyer’s psychologically induced paranoia as much as possible, and while this visual aesthetic suits the material perfectly, it will just as likely turn off a small subset of potential viewers sight unseen at the same time. Pity, because this is a pretty terrific movie. Much like he did in regards to the pharmaceutical industry and their documented corporate abuses in Side Effects, Soderbergh manages to plant some crafty bits of commentary in this film as well, this time involving both the insurance industry as well as the demands placed on mental health hospitals and the lengths they’ll go to in order to delete any red ink out of their financial ledgers. Claire’s situation, the subterfuge involved in her initial commitment into the hospital, is inspired by a number of documented cases where individuals were tricked into self-committing for 24-hours only to find themselves stuck for much longer. Institutions would find varying ways to extend a person’s confinement up to the point they exhaust their insurance coverage. Once that happened, they’d be labeled as being cured and summarily released. That story would be fascinating in and of itself, Soderbergh and his writers giving things a surreal, One Flew Over the Cuckoo’s Nest meets Shock Corridor feel I can’t help but think is intentional. But then he layers the story of Claire and her stalker into the mix, and for a good 45 minutes the director plays it pretty close to the vest as to whether or not the young woman is actually losing her mind and is imagining George Shaw and David Strine are the same person. Once the reveal is made, the young woman is such a frazzled mess even she is no longer certain she’s got enough control of her faculties to handle the situation and convince the doctors to let her out of the hospital. It all grows increasingly uncomfortable and disquieting as it all goes along, things building to an explosively emotional conclusion that is as tragically self-destructive as it is undeniably courageous. No punches are pulled here, Soderbergh crafting things in a manner that fits the current dialogue over gender inequality and sexual assault nicely. But that also means there is an repulsive side to things that is beyond abhorrent, and watching how the damage done to Claire by her stalker has changed her on such a fundamental level broke my heart in two. Foy makes all this work with an astonishing, viscerally raw confidence that’s sublime. The actress isn’t scared of showing Claire’s darker, vindictive side while at the same time nakedly opening herself up so fully I became emotionally consumed by the character’s fate and whether or not she’d remain psychologically whole. 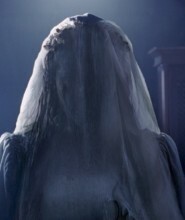 It’s a masterful performance that only grows in strength and power, the mixture of terror, conviction, poise and uncertainly Foy displays during the film’s haunting final minutes leaving me breathlessly thunderstruck. If the movie has some lumpy moments, there aren’t enough of them to become problematic. I will say the script doesn’t utilize its supporting players nearly as well I personally wanted it to, and the lapses into horror convention, especially near the end, aren’t nearly as successful as the psychologically unbalanced elements that make up the majority of the thriller’s 97 minute running time. Soderbergh still handles it all with self-assured intensity, and the way tension ratchets up throughout is extraordinary. 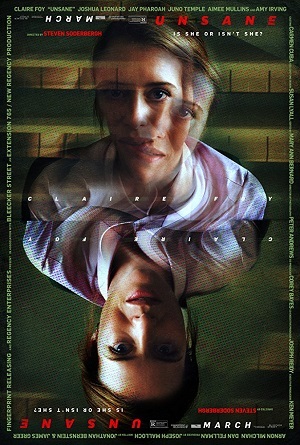 Unsane is an emotional powder keg that only grows in strength as it goes along, the resultant explosion one I’m likely to still be feeling the aftereffects of for some time to come.